Back in 2008 I won the British Fantasy Society’s short story competition with my entry, Seems Only Right. But it sort of got lost… it wasn’t announced at the Fantasycon Awards of that year, and maybe somebody read it in the BFS’ New Horizons journal in which it appeared, and although I read it at a couple of Horror Reanimated nights my gut feeling is that very few people know of its existence. 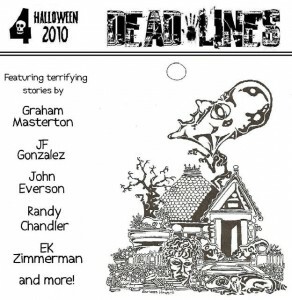 I’m happy to say that Dead Lines an American online horror fiction magazine has picked the story for its latest issue, together with the wonderful illustration that Robert Elrod crafted to accompany the piece. The magazine also has fiction from Graham Masterton, JF Gonzalez and John Everson, amongst others, so I’m in good company. Check out Seems Only Right here.